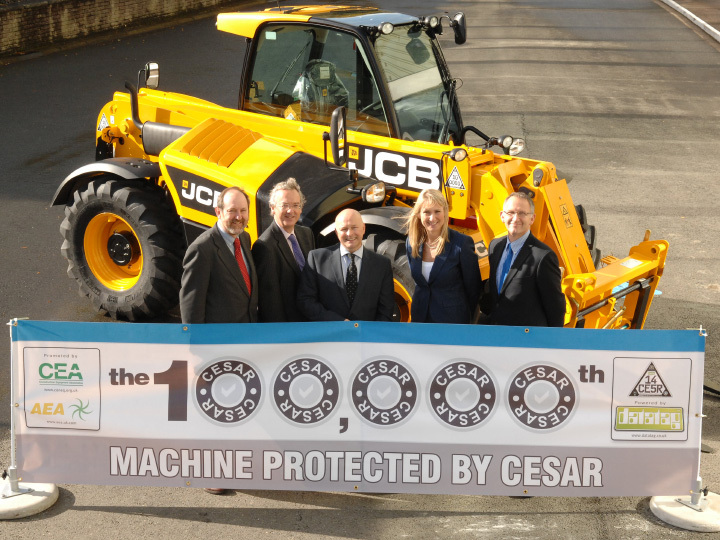 The 100,000th machine to be fitted with CESAR security and registration rolled off the JCB Loadall production line at Rocester, Staffordshire yesterday. The JCB 541-70 Loadall was fitted with an appropriate CESAR triangular tamper evident registration plate with the distinctive alpha-numeric registration mark 10OO0O (one, zero, o, o, zero, o). 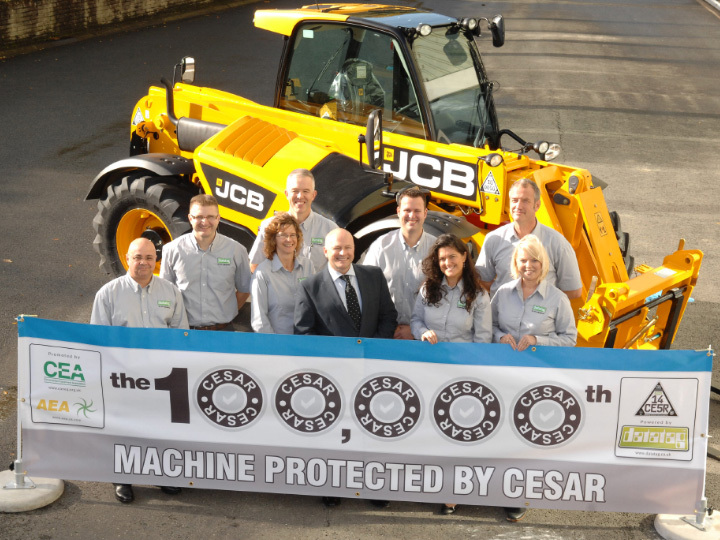 JCB was one of the early adopters of the scheme, fitting CESAR to its UK construction machines from October 2007 and to agricultural machines from January 2010. JCB built machines are a common target for professional and opportunistic criminals that prey on unwary owners and operators. 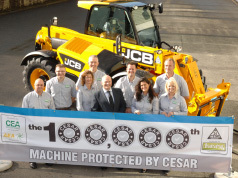 Notably with the fitment of CESAR, and other anti-theft measures, the theft rate of JCB machines, has dropped markedly. In the second quarter of 2012 just 89 JCB machines were reported as being stolen compared to 188 machines in the same period of 2009, a reduction of 52%. The milestone at JCB was witnessed by a number of people who have helped to launch and grow the scheme including Commander Steve Rodhouse, Serious Crime and Operations Directorate New Scotland Yard, who had flown to JCB, for the event, in the company’s helicopter. Commander Rodhouse is a powerful advocate of the scheme and commented, "The success of the CESAR scheme is testimony to how the construction industry, working in partnership with the police, has had a dramatic effect on reducing crime. The Metropolitan Police Service is very proud to be engaged with this project, which has had a significant impact on our ability to combat the organised criminal networks targeting the industry. I congratulate JCB for being at the forefront of the support of CESAR." CESAR works by giving each piece of equipment a unique ‘fingerprint’ using an array of high technology security marking devices, supplied by Datatag, including tamper evident triangular registrations plates, Radio-frequency identification (RFID) transponders, forensic liquid DNA, and microscopic Datadots®. 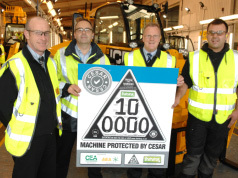 Rob Oliver, Chief Executive of The Construction Equipment Association and the man behind the development of the scheme, witnessing the 100,000th CESAR registered machine rolling off the production line commented, "CESAR has achieved what it was designed to do. Without question CESAR has reduced the rate of equipment theft and it gives the construction and agricultural industries, the police and other security agencies the upper hand in fighting organised and opportunistic criminals that target all types, all sizes and all brands of equipment. I would like to thank all the manufacturers that have adopted the scheme, the many public bodies and the police that support and promote CESAR and last but not least the AEA who enabled the power of CESAR to be unleashed in the agricultural market. 100,000 registrations in six years is a significant achievement but we’ve still some way to go to eradicate equipment theft. Hopefully the few remaining manufacturers of construction and agricultural machines that have chosen not to adopt CESAR so far may now do so." The JCB Loadall, with its distinctive registration plate, will be making an appearance at the ACPO rural crime conference due to be held in Kettering on November 8th. Nick Ground, President CEA. "100,000 registrations is a great result for the CESAR scheme. CESAR has proven to reduce theft and increase recovery rates, both domestically and internationally. It is also a fantastic demonstration of how a trade association, the CEA, can benefit its members and their customers by reducing theft and consequentially the cost of insurance and policing." Kevin Howells, Managing Director, Datatag ID Limited. 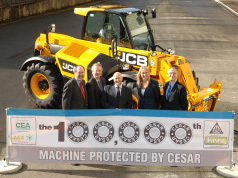 "I’m delighted to be marking this significant achievement at JCB, the venue where CESAR was launched. 100,000 CESAR registrations is a testament to the effectiveness of the scheme, both as a powerful deterrent and as an important aid in recovery. The widespread adoption of CESAR, by many leading manufacturers, has caused a significant reduction in theft rates. And it has given the police an important aid that has helped the recovery rate of stolen CESAR registered equipment reach nearly 30%." Yvette Henshall-Bell, UK & Ireland Sales Director, JCB Sales Limited and 1st Vice President of the CEA Council said: "CESAR is an important part of JCB’s armoury in the fight to protect customers' products from theft. Its introduction is already paying dividends and has, without doubt, reduced the amount of equipment being stolen. With CESAR and the fitting of JCB LiveLink and immobilisers, we really are turning up the heat on thieves and today more than 80 per cent of JCB’s products are equipped with some form of anti-theft device." Superintendent Dave Holdway, Staffordshire Police. 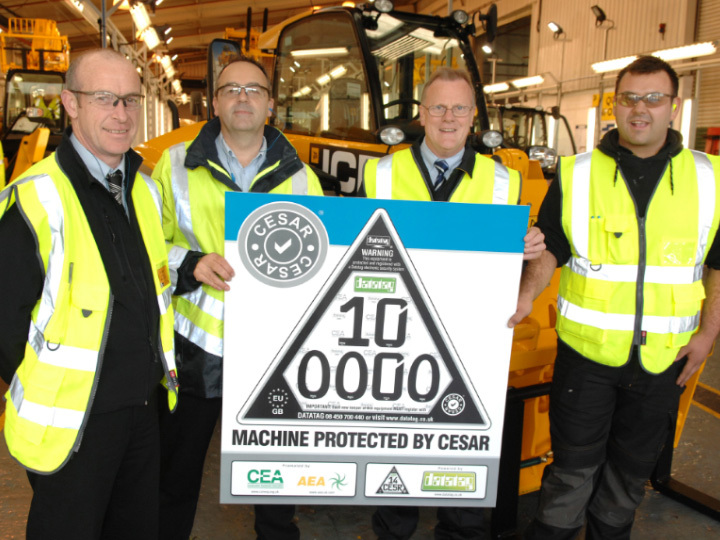 "I attended the launch of CESAR in 2007 and since then the scheme has made a significant contribution in helping the police fight construction and agricultural equipment theft. Organised criminals are attracted to equipment theft because of the high value of the items concerned. It is extremely difficult for the police to identify stolen machines unless they are registered with CESAR."